The Northern lights are always a treat. We had just finished putting out our campfire and head home when I noticed them. It doesn't always look like northern lights at first. In fact, my camera can see them better than I can with the appropriate settings. I didn't even believe that it was them until I took my first photo, with the trademark glowing green for auroral activity confirmation. I went into a flurry of frame-grabbing immediately. Luckily, I already had a tripod nearby, and only had to lock down my manual exposure and focus. I managed to nail it first shot or two, at ISO 6400, f/4 and 15 second exposures. Each value was chosen for a reason, and it just so happens in this rare case, those values were exactly what I needed. 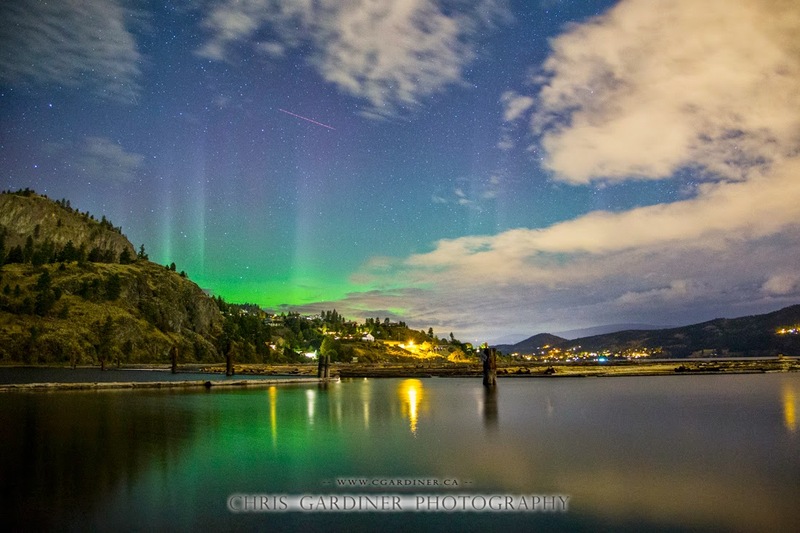 Prints from the Images of the Northern Lights from Bear Creek on Lake Okanagan are available for purchase upon request. ISO 6400 ; this is largely camera dependant value. I was on my 6D. After having a few months with this body, I have come to fully appreciate its noise handling. 6400 on this 6D is similar in appearance to ISO800 on my XTi, only I have twice as many pixels so its even easier to correct. f/4 ; this value is largely lens dependant. I was on my 24-105 f/4 L. shoot wide open. 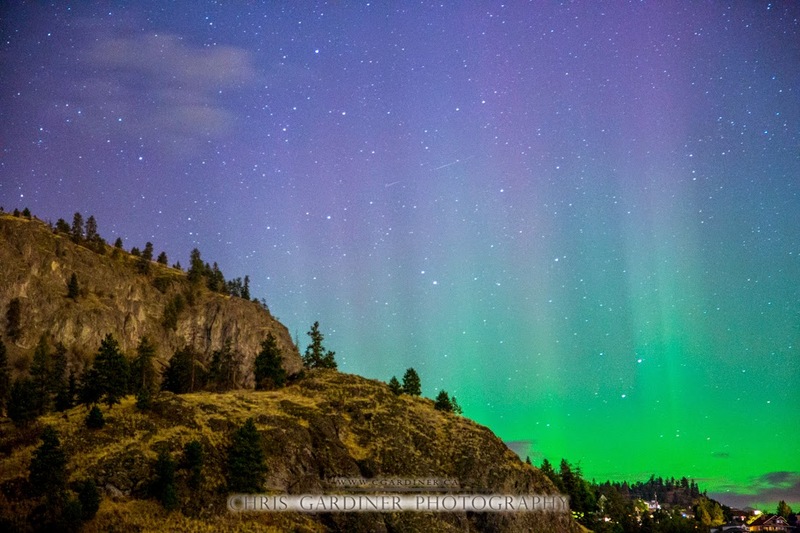 the northern lights and all the stars are always focus at infinity as far as DSLRs are concerned. 15s ; I used 15 second exposures because it's a good amount of time to keep a sharp spike, keep sharp stars, and still allow a decent amount of light in from ambient. 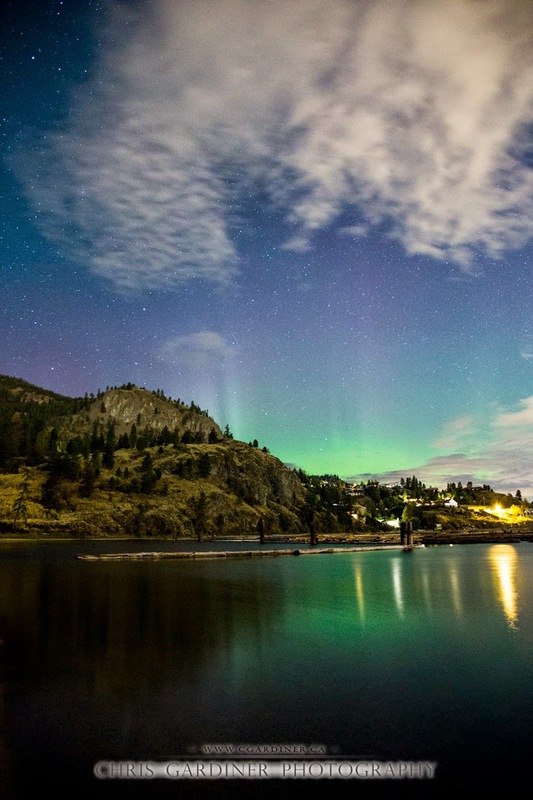 Good luck shooting the northern lights!